Migratory game birds include mourning and white-winged dove, band-tailed pigeon (see also this dove and band-tailed pigeon USFW identification guide), sandhill crane, ducks, geese, coot, common moorhen, snipe, sora and Virginia rail. For more in-depth hunting and license information, reference the New Mexico Migratory Game Bird Hunting Supplement. Season dates and bag/possession limits are not final until published by the U.S. Fish & Wildlife Service in the “Federal Register” available online: www.federalregister.gov/agencies/fish-and-wildlife-service. The U.S. Fish & Wildlife Service requires all migratory game bird hunters to obtain a Harvest Information Program (HIP) number, pg 3. Each regular-season (Eastern) sandhill crane hunter must possess the appropriate license(s) (page 3), plus a federal Sandhill Crane Hunting Permit (free). There is no limit on the number issued and no application deadline. 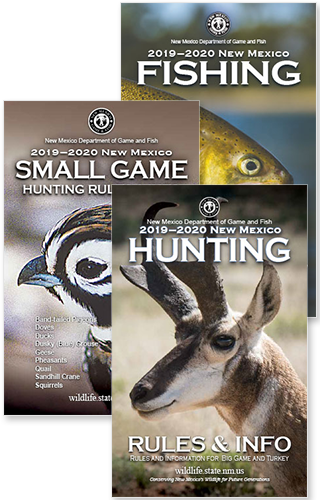 Permits are available online: www.wildlife.state.nm.us at NMDGF offices and at all license vendors (One-dollar vendor fee may apply). A federal Duck Stamp is not required to hunt sandhill cranes. Each special-season sandhill crane hunter must have the appropriate license(s) (page 3), plus a special-season permit issued by drawing (hunt codes and dates listed on page 13). Applications may be made online or telephone: 1-888-248-6866. Applications must be made by August 22 before 5 p.m. MDT. No more than four persons may apply per application, and no more than two persons per youth-only hunt application. Nonrefundable application fees are $7 per resident and $13 per nonresident. Additional information about hunt requirements will be given to successful applicants. A federal Duck Stamp is not required. For information about the light goose hunt at the Bosque del Apache and the dark goose hunt at the Las Vegas National Wildlife Refuge, please contact refuges directly (page 9). A Band-tailed Pigeon Permit is required for hunters participating in band-tailed pigeon hunts (see page 11). A Light Goose Conservation Order Permit is required for hunters participating in the conservation order hunts Feb. 1–March 10, 2018 (see page 14). Permits are available online, at NMDGF offices and at all license vendors (One-dollar vendor fee may apply). There is no deadline or limit to the number of permits issued. Federal law requires all waterfowl hunters 16 years of age or older to carry a valid federal Migratory Bird Hunting & Conservation Stamp (Duck Stamp) which is signed in ink across the face. Stamps are available online: www.wildlife.state.nm.us or www.duckstamp.com and at U.S. Post Offices, NMDGF offices and at all license vendors. A valid hunting license that displays “Federal Duck Stamp” meets the federal requirement for 45 days from the date of purchase. 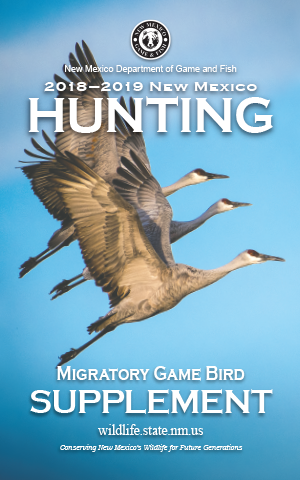 Click Here to download the 2018-19 Migratory Game Bird Supplement (or visit Publications). One fully feathered wing must remain attached to all migratory game birds until transported to the hunter’s home or storage facility. One fully feathered wing is not required for band-tailed pigeons or doves. No game of any kind may be placed or left at any location nor given to another person, unless that game is properly tagged by the hunter. A sample certificate is provided on page 23 and available online: www.wildlife.state.nm.us. The statement must include the kind and number of game, the date and county where taken, the name and license number of the hunter and the date and place where the donation occurred. Tagging is required if the game is being transported by another person for the hunter or if the game has been left for cleaning, storage (this includes temporary storage), shipment or taxidermy services. Game may not be shipped, unless the package is marked on the outside with: 1, name and address of person shipping; and 2, name and address of the recipient. Migratory game birds may be taken with a shotgun fired from the shoulder, provided it is no larger than 10-gauge and incapable of holding more than three shells, or it is plugged with a one-piece filler that cannot be removed without disassembly which renders it incapable of holding more than three shells. Migratory game birds also may be taken with muzzle-loading shotguns firing shot, bow and arrows and crossbow and bolts. Persons hunting any waterfowl, coot, common moorhen, crane (draw hunt only), snipe, sora, or Virginia rail with shotguns (including muzzle-loading shotguns) must use and possess only USFWS-approved nontoxic shot. Shotgunners hunting any species of migratory game birds on all State Game Commission owned or managed areas must use and possess only USFWS-approved nontoxic shot. Nontoxic shot is not required for dove, band-tailed pigeon and the Eastern sandhill crane hunt outside of New Mexico State Game Commission owned or managed areas. Nontoxic shot includes: bismuth-tin, iron (steel), copper-clad iron, iron-tungsten, iron-tungsten-nickel, tungsten-bronze, tungsten-iron-copper-nickel, tungsten matrix, tungsten polymer, tungsten-tin-iron, tungsten-tin-bismuth, tungsten-tin-iron-nickel and tungsten-iron-polymer. Anyone who takes game birds must transport the edible portions of the meat from the field for human consumption. No person shall take migratory game birds except during the hours open to shooting or falconry as prescribed. It is legal to use artificial decoys, blinds and dogs. It is illegal to shoot at any protected species from within a motor vehicle, power boat, sailboat or aircraft. Migratory birds may be taken from a motor-driven boat (or other craft with attached motor) or sailboat, provided that craft is resting at anchor, fastened within or alongside a fixed hunting blind or used solely as a means for retrieving killed birds.